A shattering new thriller about three women, strangers, on a heart-wrenching collision course none of them could have seen coming. Long after anyone expected Kate to do anything with her life, she did. Using the journals left behind by her aunt and grandmother, she wrote a novel based on a very real... read more generation-old love story that ended in tragedy. On the other side of town, Emily is about to set fire to her life. She's in a dead-end job and is involved with the wrong man; she can feel herself being drawn into darkness, with horrific consequences. With nowhere to go, she finds herself on the run. Without knowing each other, and with lives that couldn't be more different, Kate and Emily head to the same point on the map: Heart Island, an idyllic place in the middle of a lake in the Adirondacks, owned for generations by Birdie Burke's family. The harsh and unyielding Birdie is at one with this island, which has a terrifying history all its own. She, too, has consequences to face." Heartbroken" is a tense, mesmerizing novel about the limits of dysfunctional families, of an island haunted by dark memories and restless ghosts, and of the all-too-real demons we must battle. 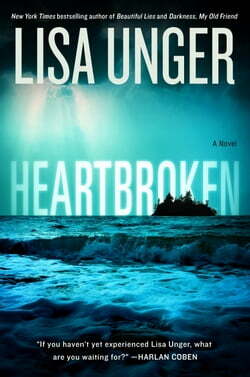 Wonderfully suspenseful, exquisitely crafted, and written with raw, emotional power, this is Lisa Unger at her very best.